Stephen Ferris missed Ireland's tour to New Zealand with a calf injury. LEINSTER WERE THE favourites going into the Heineken Cup Final in May but Ulster fancied their chances. The result was still touch-and-go at half-time before Sean O’Brien and Isa Nacewa made crucial contributions. The final scoreline of 42-14 was a harsh reflection on a determined Ulster effort. While Leinster remain the team to beat, going into another dual campaign, Ulster have made some telling additions in the form of three old boys. Roger Wilson returns from Northampton, Niall O’Connor is back from a stint at Connacht and Tommy Bowe has brought some extra spark to Ravenhill. It is enough to make Stephen Ferris very excited about the start of the new season. Ferris is back in full training after a calf injury and surgery on his thumb in the summer but he may not feature until the home game against Munster on 14 September. The flanker says it is good to have ‘mates’ like Wilson and Bowe back in the mix but he is also eager for young talents, such as Craig Gilroy and Paddy Jackson continue their outstanding development. There is a lot of rugby to be played, in Paddy, and he definitely has the potential to be one of the best around and he’s got a bloody good team around him. Hopefully him and Niall will do a good job for us this year. The Maghaberry man rues the fact that Ulster ‘played into Leinster’s hands’ in their heavy defeat at Twickenham but concedes that ‘we didn’t deserve to win’. You have to take your hats off to Leinster, I don’t think any club side in Leinster would have beaten them on that given day. They’re the best side in Europe and that is why they have won the Heineken Cup the last two years running. Following the repositioning of Brian McLauglin to a developmental role, New Zealander Mark Anscombe’s vision for Ulster is starting to take shape. The backline will prove a serious scoring threat, with a tried and trusted pack providing a solid base and the craft coming from Jackson, Ruan Pienaar and Paul Marshall. “Mark has spoken serious words to all the squad,” Ferris assured us. While Ireland did not exactly cover themselves in glory, barring the close call in Christchurch, during their summer tour, Ulster is sure to benefit from the experience. Dan Tuohy was given an extended run in the second row while Declan Fitzpatrick held his own during his debut at Eden Park. Luke Marshall, Chris Henry and Darren Cave would have like a greater involvement, Andrew Trimble came in and out of the team, and Rory Best was commitment personified. Ferris can speak to the ego-boosting effects of time spent with the national team but remarks that none of the players have arrived back demanding bigger car parking spaces. On the other hand, maybe we do need to walk around with a bit more of a swagger. At the end of the day, we are Heineken Cup finalists last year. Maybe we do need to play with a bit more of a swagger, the way Leinster and Munster have done over the last few years. Watch out for glimpses of that swagger when Ulster play friendlies at Ravenhill against Leicester (18 August) and Newcastle (24 August). 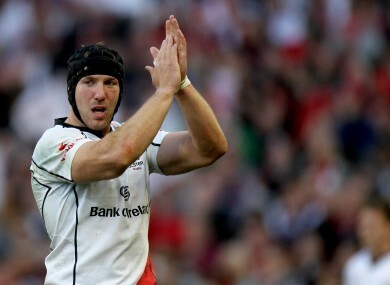 Email “Stephen Ferris: Bloody good Ulster need to play with a bit more swagger”. Feedback on “Stephen Ferris: Bloody good Ulster need to play with a bit more swagger”.